This recipe came about with thanks to my die-hard, thrill seeking obsession for motorbikes… sounds strange right? I had the luxury of attending the 2017 MotoGP at Phillip Island this year, where my only concern was not about the weather or wearing an old plastic Telecom Poncho (another story for another time) – but was entirely about whether I would be able to eat anything on the day. This anxiety stems from asking for the hundredth time “have you got anything gluten and lactose or dairy free”, feeling like a burden on the poor waitress or waiter and the often unfortunate reply. HOWEVER, I was delighted, shocked and thrilled to discover that just about every cuisine was served, food truck and tents galore with smells to drive your senses wild to hunger! Including the one and only, Paella truck that is branded in big bold writing GLUTEN & DAIRY FREE. This was just the icing on the cake for such an awesome day, even if my favourite childhood rider hadn’t placed, even if I had no interest in motorbikes, I’d go back just for the food – it was that good. 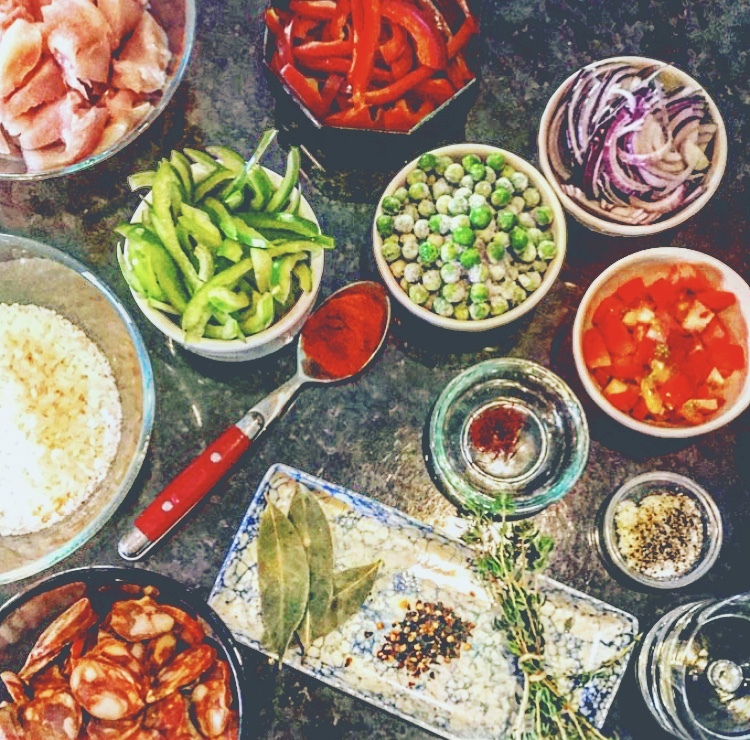 And that’s what brings us here, I’ve been doing my research to create my own delicious, authentic as can be paella (despite the fact I don’t own a paella dish). Having devoured such a delicious dish, I wanted to make it for myself. Seeing so much food in such a big pan was daunting though, it looks like a tricky dish to make – but I kid you not, it’s so simple! 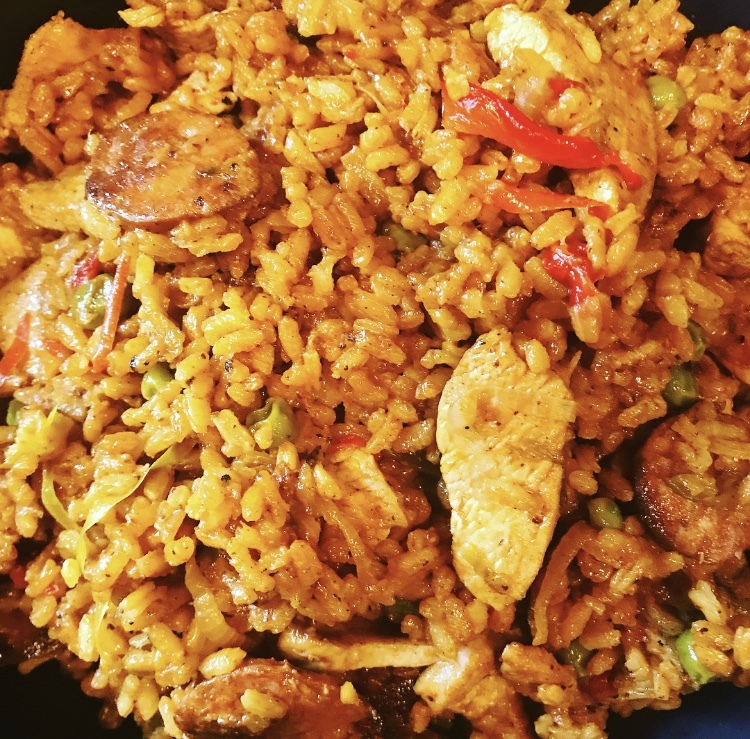 So on that note, I’ve spent the last couple of weeks researching how to make authentic as can be Paella. I’ve looked at how the Spanish create an onion jam like recipe, how the stock must be boiling and why, how to release the flavours of saffron to their fullest and how to get all the flavours into every single bite. On the back of that research, I’ve formed my recipe – step by step, with as little time required in the kitchen as possible and as authentic as I can possible make it. First, we’re going to prepare everything needed as the dish itself does not take long to cook. Finely slice the red onion and set aside in a small bowl. Mince the garlic into a small dish and add a pinch of salt and pepper and the chilli flakes, set aside again. Slice the capsicums and set aside in a bowl. Measure out the wine and set aside. Measure out the paprika, the peas and the tomato paste and the rice into 3 separate bowls. On a separate, clean chopping board, slice the chorizo and set aside in a bowl. On another clean chopping board, roughly slice the chicken breasts (make them approximately the same size) and set aside. In a large, shallow non-stick fry pan (or paella dish – but I don’t have one so I used a large electric frying pan) pour the oil in. Heat the pan to medium-high (on an electric fry pan I used setting 8). Add the chilli, garlic, salt, pepper, thyme sprigs, bay leaves and onions and sauté until the onion is translucent. Remove the onion mixture from the pan, leaving the thyme and the bay leaves in the pan. Add the chorizo pieces and allow to sizzle in the pan to release the oils they contain. At this stage, add the saffron threads to the boiling chicken stock and allow to steep. Remove the bay leaves and the thyme bunch from the pan. Add the chicken to the pan and brown, briefly, before adding the onion mixture, tomato and capsicum to the pan. Saute briefly, then add the rice, tomato paste, paprika and wine to the pan. Allow the rice to fry for a few seconds without stirring or adding stock. Reduce the pan heat to about 6. Finally, add the stock and the peas. Place the lid on the dish and allow the rice to cook through, without stirring. Once the rice is cooked through and the liquid absorbed, approximately 10 minutes, stir the peas through and to scrape away any stuck pieces from the bottom of the pan (it won’t be burnt, don’t worry). Serve immediately, scattered with parsley and a wedge of lemon if desired. To prepare, approximately 20-30 minutes. Cooking time 25-30 minutes depending on pan size and heat. NOTE: The pan must be large enough so that once all ingredients are in the pan, the total rice depth is only 3-4cm. This will allow a quicker cooking time and for the flavour to be absorbed through the entire dish.